The Austrialian central bank signalled there are no rate cuts on the horizon. The next move is probably a hike. Despite some market participants talking up the prospects of an RBA rate cut next year, the minutes of the June policy meeting (no change to policy) leave little doubt that the risks to policy fall squarely on future tightening, not easing. The minutes noted that macro-prudential measures designed to cool the housing market, and rein in household debt, “…were yet to have their full effect” – code for “are not working”. 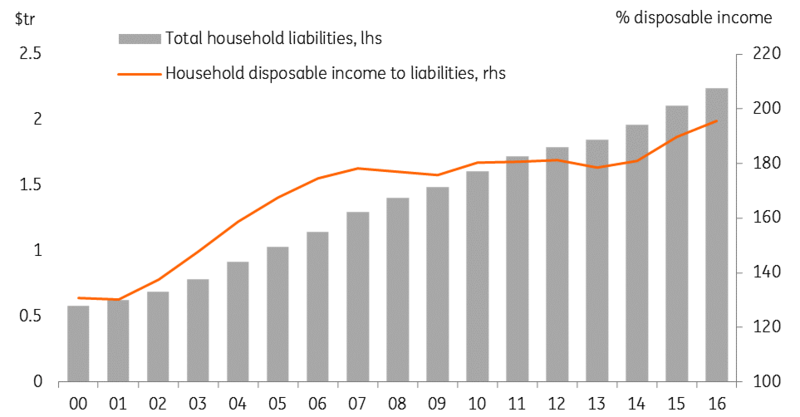 Household debt to income ratios are also worryingly high. The pressure in the housing market was made more evident from the latest housing data – showing house prices rising at a 2.2% QoQ pace in 2Q17. This growth leaves annual house price inflation at 10.2%YoY, more than the consensus had been expecting, and leaves the quarterly growth trend on an ascending path. There are possible signs of house prices easing in areas that have been negatively affected by the commodity price decline (Perth, Darwin), but in Sydney, Melbourne, Hobart and Canberra, house price growth is in double digits, and the trend still seems relentlessly upwards. House prices in Brisbane and Adelaide are growing more modestly. Australian bank bill futures suggest also that the next move for the RBA is up. Though a hike is not fully priced in until the end of next year.